Special Olympics Illinois Chicago/Area 3 hosted a special in-house Motor Activity Training Program (MATP) event at Alden Village North on Aug. 30. The Special Olympics Motor Activity Training Program is designed for athletes who are unable to participate in official Special Olympics sport competitions because of their skill and/or functional abilities. Alden Village North serves severe and profound athletes with a variety of specific needs that made it difficult to be involved in the Area 3 MATP event in March. Instead, this event was created to include many more of Alden’s residents in a fun day of training and learning new skills. Throughout the morning, athletes rotated through 11 stations with their peers. The day concluded with an awards ceremony to celebrate their strength and determination. The Alden Village North athletes were all smiles during their Motor Activities Challenge Day! View photos from this event. 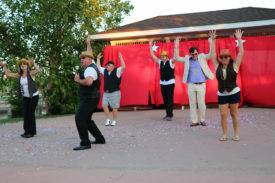 SOILL Heartland/Area 6 and the Law Enforcement Torch Run hosted a Lip Sync Battle on Aug. 11 at Mackinaw Valley Winery. This inaugural event featured Central Illinois celebrities who “sang” their hearts out against other local celebrities and raised $11,000 for Area 6 athletes and their families. The ReMAX Rising team raised the most money with their performance to “Uptown Funk” to receive the first place trophy. Other awards included “Best Performance” given to the Local Law Enforcement Team and “Keep Your Day Job” given to McLean County State’s Attorney Jason Chambers. Gold level sponsors included Heide Wealth Management, ReMAX Rising, Radio Bloomington, Mackinaw Valley Winery and Tri-Valley Schools. Silver level sponsors included Core 3 Management, L & S Mechanical, Rave Homes and McLean County Orthopedics. Bronze level sponsor was Knob Hill. SOILL East Central/Area 9 hosted the 32nd annual Special Olympics Family Festival on Saturday, Sept. 17, on the grounds of Lake Land College in Mattoon. 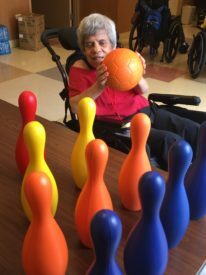 The event draws Special Olympics athletes from surrounding Areas and pairs them with a “friend for the day” to guide them through the day’s fun of carnival games and activities. About 700 participants and 1,200 volunteers participated in the event. 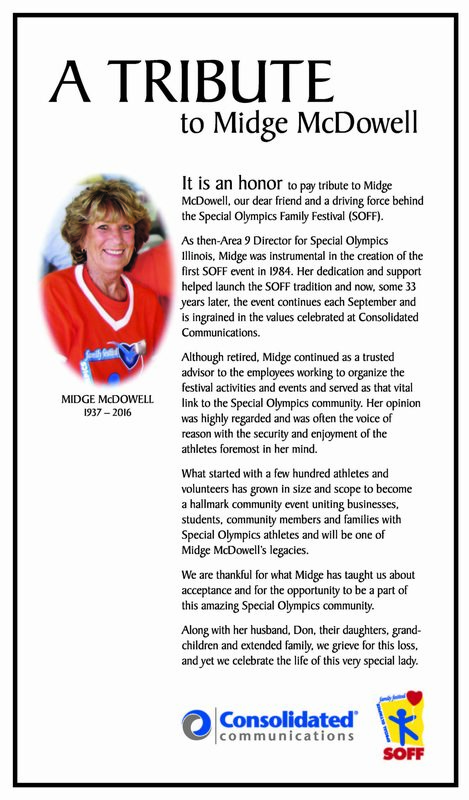 The day also celebrated the life of Area 9’s former Director Midge McDowell who passed away earlier this year. 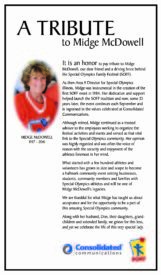 McDowell was instrumental in starting the Family Festival during her long tenure with Special Olympics Illinois. View larger version of tribute ad at right. Consolidated Communications started the festival in 1984. It’s organized by the company’s employees along with partners from Sarah Bush Lincoln Health Center and First Mid-Illinois Bank & Trust. 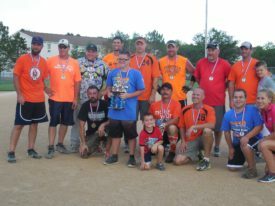 Read the latest news in Area 9’s September newsletter. 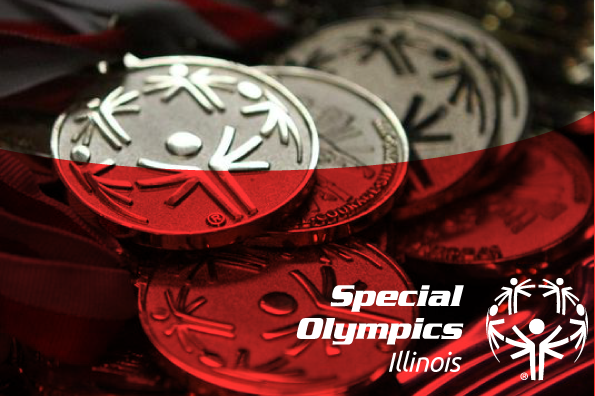 This October, IKOR of Chicago will be putting on a Virtual 5K/10K Walk and Fun Run to benefit Special Olympics Illinois. You can complete the Virtual 5K/10K Walk & Fun Run anywhere and anytime between Oct. 1-7. Registration is $35 per adult and $20 per child. All participants will receive a participation medal via mail once they have completed their registration on Active.com. IKOR Advocates are independent professionals looking out for the needs of our clients. They go beyond traditional case management to provide their clients with the services they need in every aspect of their life. They are advocates first, providing guidance, planning, over­sight and the implementation of plans designed to focus on clients’ critical life challenges. Interested in participating in the Virtual 5K/10K? Register here! View flyer. The Southern Illinois Ducky Derby Dash at the DuQuoin State Fair splashed down on Sept. 4 with 6,800 ducks raising for the finish line. The derby were adopted with a preliminary total of $30,000 raised for Special Olympics! We couldn’t have done it without our Sponsors, including Coca Cola, Southern Illinois Credit Union, Apple Vacations, Chicagoland Speedway, Country Financial of DuQuoin (Keenan Rice and Steve Marek), St. Nicholas Brewing Company, C&C Pumps and Supply, Roland Machinery, Black Diamond Harley Davidson, The Late Bill Mathis Sr. and Family, Fenton’s Customs and Collisions, WSIL Channel 3, River Radio, The Southern Illinoisan, and the DuQuoin State Fair! Our Ducky Derby Ambassador for 2017 will be Abbi Williams, whose team sold 1,270 ducks!!! !